TRENTON, N.J. (AP) — The Supreme Court's decision Thursday to uphold President Barack Obama's historic health care overhaul is expected to benefit nearly every corner of the health care industry by expanding coverage to millions of Americans. But it's not a slam dunk. Hospitals and drugmakers are expected to be flush with new customers because of the law's requirement that most Americans have insurance by 2014 or pay a fine. Insurers also are expected to experience a boon, but they'll face a new round of fees and restrictions. It's unclear if medical device makers will get the same jump in business, and the law calls for them to pay new taxes. Meanwhile, the overhaul is expected to boost health care stocks both by increasing access to — and use of — health care. On Thursday, shares of hospitals and some insurers rose following the ruling. Shares of the largest U.S. drug companies were mixed, while shares of medical device makers dipped slightly with the broader market. But the health industry — and company stocks — still face uncertainty, at least until the November's presidential election. Republicans want to scrap the law. And health care companies oppose some aspects of it. Some companies and industry trade groups issued statements Thursday that said they plan to work with the White House and Congress to change or eliminate provisions that they consider bad for their businesses, patients or both. One of them, French drugmaker Sanofi SA, has extensive operations in the U.S. The company, which makes the popular blood thinner Plavix, put out a statement Thursday that said it recognizes "the conversations around the direction of health care in America will continue." Some 30 million or more Americans are expected to get health coverage when the so-called individual mandate that requires nearly everyone to have coverage takes effect. That should reduce the number of uninsured patients who need urgent care showing up at hospitals. Such charity care has been a drag on hospitals, totaling about $39 billion in 2010. Federal payments to hospitals to offset some charity care costs likely will be reduced as more people are insured. But hospitals will benefit from those who are newly insured. Those people are expected to seek more tests and nonemergency treatments at hospitals, including for chronic health conditions such as diabetes. "Hospitals may be the biggest beneficiary because their biggest problem is people without insurance," said Les Funtleyder, health care fund manager at Poliwogg, a private equity fund for small investors. But there are downsides for the sector. Roughly half of the patients gaining insurance will be covered by Medicaid, the federal-state program for poor and disabled people. Like Medicare, it reimburses hospitals less than care actually costs — and less than private insurers. In addition, hospitals will get smaller annual increases in Medicare payment rates under the law. Additionally, the government and private insurers will demand better outcomes, not just more care. In order to achieve that, hospitals will be forced to make improvements. And technology shifts such as adopting electronic health records won't come cheap. "There are a lot of variables to be worked out," said UBS health care services analyst A.J. Rice. But "the net effect should be positive." For drugmakers, the law may be a wash. The law — which the industry strongly supported — didn't carry significant reductions in what government programs pay for medicines. That's a big positive given that drug prices are much higher in the U.S. than other countries. In addition, drugmakers have to give increasing discounts to seniors on Medicare when they hit the "doughnut hole" coverage gap each year, and must pay much-higher rebates to the government on drugs bought through Medicaid. Major drugmakers last year each reported higher costs and lower revenues totalling roughly $500 million from the fees, rebates and discounts combined. All those costs from the overhaul already are reflected in drugmakers' share prices and financial forecasts, said UBS drug analyst Matthew Roden. He said the companies likely will get a boost in drug revenue from new patients starting in 2014, but not a huge one. That's because patients needing the most-expensive drugs, for cancer and rare disorders, aren't going without now. They generally are getting them through government or industry patient assistance programs. 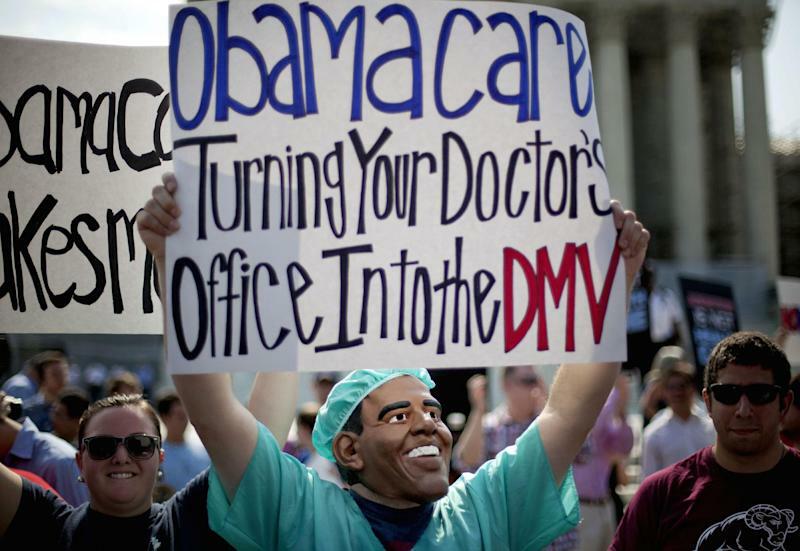 Insurers will likely add millions of new customers because of the individual mandate. They'll also benefit from tax credits that will help middle-class people buy individual policies through new insurance exchanges that are like online marketplaces and expansion of the state-federal Medicaid program to cover more poor people. But health insurers will face restrictions and hefty fees. They'll pay annual fees starting in 2014, totaling $8 billion that year and rising after that. The law also restricts how much insurers can vary their pricing based on things like age and health. And it will require them to cover everyone who applies starting in 2014, even those already sick with expensive conditions such as diabetes. Additionally, the law stipulates that insurers spend most of the premiums they collect on care, or pay rebates to customers. Insurers that rely heavily on providing plans for individuals and small businesses will see their profit margins squeezed the most by the coverage limitations and premium spending rules. On the other hand, providers of Medicaid coverage will benefit the most because the law preserves that program's expansion. 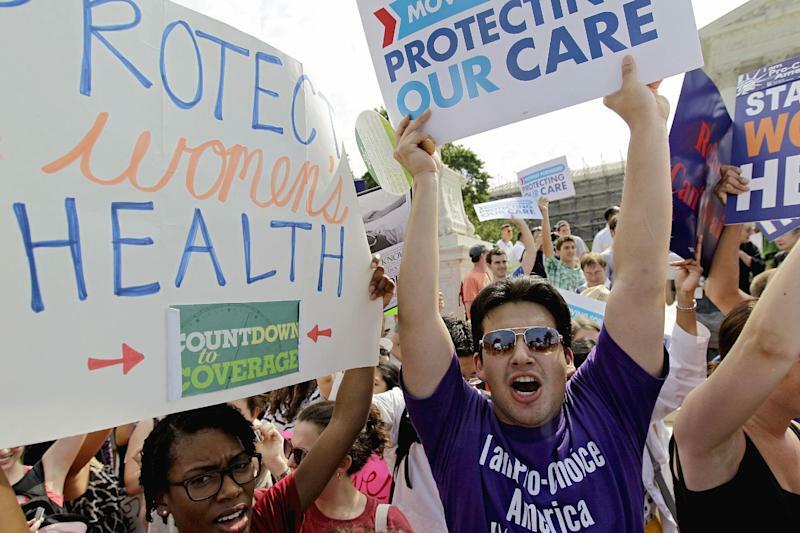 And analysts say the ruling won't have much of an impact on companies that have diverse sources of revenue like UnitedHealth Group Inc., the country's largest insurer. Citi analyst Carl McDonald said insurers face considerable risks that they will get mostly sick people signing up for coverage in the online health insurance exchanges that begin in a couple years, because the penalty for not signing up is only a $95 tax, at least initially. Michael McCallister, CEO of Humana Inc., the fifth-largest health insurer, said now that the law has been upheld, he wants to focus on improving it "to provide some relief from the sticker shock that's going to come with a lot of the things that happen in 2014." Those include what he calls unfair taxes on insurance premiums. He also said younger, healthier Americans might be hit with higher premiums because insurers will likely look to make up for the fact that they can no longer charge older, sicker customers more. For medical device makers, the bad news is that they'll have to start paying a 2.3 percent tax beginning in January on sales of devices such as pacemakers and CT scan machines. But it's unclear whether increased sales down the road will offset that tax. Funtleyder, the health care fund manager, doesn't foresee a big jump in device sales: "People who need a pacemaker already were getting one." But Leerink Swann analyst Richard Newitter wrote that he expects more doctor visits and hospital procedures to increase sales of devices. Either way, one trade group for the industry, the Medical Device Manufacturers Association, said that Congress and the president must repeal the tax, arguing it would make it harder for companies to develop innovative new devices. "It is clear that this misguided policy has already led to job losses and cuts to research and development," Mark Leahey, the group's president, said in a statement. AP business writers Tom Murphy in Indianapolis, and Daniel Wagner and Matthew Perrone in Washington, D.C. contributed to this report.